Fiberbuilt Patio Umbrella 7 1/2 Foot Hexagon with Two Piece Aluminum Pole and Spun Acrylic Fabric Top, 15 Lbs. Fiberbuilt Patio Umbrella 9 Foot Hexagon with Two Piece Aluminum Pole and Spun Acrylic Top, 17 Lbs. Our fiberglass rib market umbrellas are made with industrial quality materials designed to last for years in any commercial environment. These highly durable umbrellas provide stylish shade at restaurants, resorts, hotels, HOAs, and apartment poolsides across the nation. The flexible nature of the fiberglass ribs supplies maximum stability to the umbrella, ensuring it won't fly away in high winds. Our fiberglass ribbed umbrellas are crafted with marine grade fabric available in a wide range of unique colors, constructed to resist mildew, salt air, and fading. Picnic Furniture's selection of commercial grade market umbrellas is the perfect shade option for poolside patios and beachfront locations across the USA. 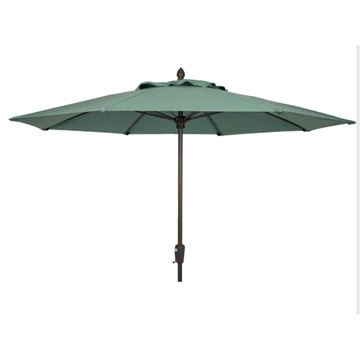 Browse of collection of commercial poolside tables and picnic tables that are compatible with these heavy-duty umbrellas, to provide patrons with a stylish, shaded seating option. Call or chat with our expert staff for discounts on quantity orders or a personalized quote.